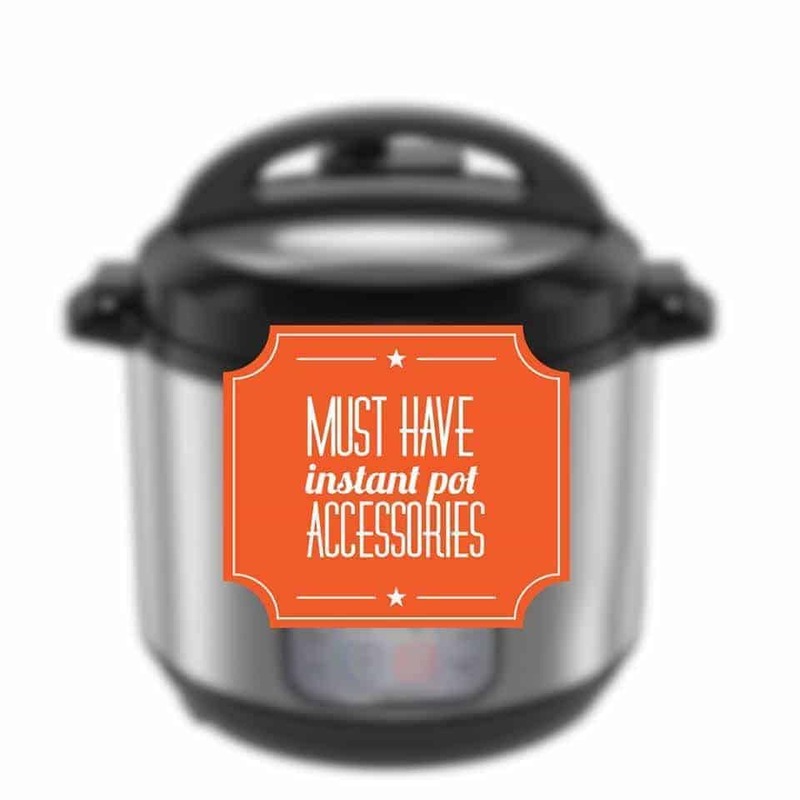 So here’s my personal list of Must have Instant Pot Accessories– as well as some that may just be nice to have. If you’re already an Amazon Prime Member, you may know about Amazon Prime Day where items can be sold at fabulous discounts. Last year’s best seller by far was the Instant Pot, with 215,000 units sold. I created this list to help new IP owners so can you please tell me what else I should add? Note that all the Instant Pot Accessories listed here are ones I personally use, so they’re tried and tested. I haven’t listed anything that I haven’t personally tried. Please also note that these are affiliate links. I like this model so much that I have two of them. The main thing I like about this is that you don’t have to remember to seal the vent, which is something I always forget to do, and then my food burns. As soon you close the lid, it automagically seals the pot. It also allows you to do sous vide, and it has a few additional buttons like Cake etc. that I actually do use. The things that take getting used to are the dial and mouse controls, and the fact that you have to hit Start, whereas the Duo starts on its own. If you’re buying a new IP, I’d strongly suggest you look at this one as your starter, unless the price is an issue, in which case the Duo is a fine machine. CHECK THE PRICE AND REVIEWS HERE! I’ve just posted an information-packed video review of the IP Mini Duo. No idle chit chat, just good, usable information on what exactly it will hold, can you do PIP with it, how long does it take, does the different wattage impact recipes? I particularly like the Duo because you can make Yogurt in this pot, and I think a 6 quart is a great starter pot for families of 2-4 members. I tend to use this for Yogurt as it is wider than the Ultra below (which is taller), so more of my jars fit into it at a time. If you are cooking for a larger group, you may prefer the Instant Pot 8 Quart. They also make an Instant Pot Lux but I don’t have one so I won’t review it here. The main thing is it can’t make Yogurt. But I use that yogurt function to make yogurt, to proof bread dough, and to sprout seeds so it’s actually useful for more than just Yogurt. Just something to keep in mind. The Lux also doesn’t have a low pressure setting which I use for cooking fish. I must say I do love my glass lid. It’s very handy for slow cooking, and it’s very handy for when you make yogurt. Especially if you worry about your yogurt taking on the smells of whatever you cooked in there before, this lid is quite useful to have. Besides, you get to stare at your food when it is slow cooking, which I enjoy. Weird, but true. I didn’t think I would like this one as much as I do, but it’s actually quite handy for things that stick, or could stick, such as rice with tomatoes, mac and cheese, pasta with tomato sauce, etc. It’s also handy for something cooked with sugar, as that can get sticky. The pot does clean up like a dream, and at $15 for 6 quart and $25 for the 8 quart ceramic liner I think it makes a good addition and an inexpensive way to get an additional liner for your pot. If you’re worried about the ceramic coating on the liner above, or if you want to use steel utensils etc, you might want a stainless liner. It’s great to be able to cook things back to back without having to wash one out first. A lot of people have different rings for sweet, savory, etc. I don’t. I use the same ring for everything. Just because the ring smells of something doesn’t mean your food will, so I don’t mess with it. But if you’d like to have separate rings, these would work. This popular insert can be used for a lot more than Cheesecake. I’ve made a Poblano quiche, bread pudding, corn pudding, etc. in these types of pans in addition to regular cheesecake of course. They’re really quite handy to have around. I use this one all the time. The IP comes with a rack, and one with handles, but I like this one better because it’s taller and it keeps whatever I’m cooking out of the water. I can also use this when I’m trying to stack things on top, so if I’m making a pot-in-pot thing with beans at the bottom and the rice on the top, this higher steamer rack keeps my second item out of the soup at the bottom. Check out this post for how I use this. I’ve been cooking with pressure cookers for a long time. I bought this in April 2015 according to Amazon, and I’m still using this. I love the little button on top to hold the basket in a curve to prevent the contents from falling out, but the little handles also work as slings, so I highly recommend this basket. I used to use foil to cover all the pots I used inside the Instant Pot but it’s quite wasteful. I like this packet of lids because they’re not too expensive, and they tend to fit a variety of pots. The silicone helps it to form a slight seal which keeps moisture out. Best money you will spend to keep your hands from getting burned or spilling your dinner as you try to get it out of the pot. They’re small, they fit all hand sizes, and they fit inside my flatware drawer. You really don’t want to use regular cloth mitts as the water from the IP will permeate through the traditional oven mitts and burn you. This rack isn’t very high, but it has nice handles that eliminate the need for foil slings that I don’t trust (actually it’s not the foil’s fault, I don’t trust myself to make one that won’t break, taking my cheesecake to the floor with it). This silicone loaf pan is one of ther few rectangular pans for the Instant Pot. I find it works well for things that are not entirely liquid, such as meatloaf. For things that are runnier than that, the pan leaks unless you either cover with parchment paper on the inside, or cover with foil on the outside. Also, don’t do what I did, which is try to broil in this pan too close to the heat source. It melts under direct high heat. I have something very similar that I got in India, and I’d suggest you look at the local Indian Grocery store for a cheaper alternative, but if there’s not one close to you then these stackers are a great addition. They’re great for cooking multiple things at the same time. I usually do dal and rice when I’m cooking Indian food. I have two kinds of jars that I use to make Vietnamese Yogurt or the Smooth Cardamom Yogurt. Of the two, I like this one a little better because the sides of the jars are smooth and so it’s easier to get the last bit of yogurt out with a spoon. About 5-6 of these fit at one time into my Duo, which leaves about 4-5 more that sit out until the first batch is done. This is the second set of jars I use for Yogurt and they’re awfully cute as well. I use a mix of the ones listed above and these to hold a batch of yogurt at our house. If you want to make small quantities of Greek yogurt this Cuisipro Donvier is the way to go. The screen is sturdy, it cleans up really well with just a good rinse, and it doesn’t take up half your fridge. The insert is also slightly slanted, so your yogurt isn’t sitting in the whey once it starts to drain. I really love this guy. If you make larger quantities of yogurt at a time, people love this one. I ordered it but sent it back because it was too big for us, but it is a well-made and sturdy device that works well, and cleans up easily. I use this for so many of my dishes like Butter Chicken,Poblano Soup etc. and while this is a little more expensive than some of the others, I think it’s sturdy and totally worth it. I use it daily for something or the other in my kitchen, including protein shakes.